NEW YORK—On your average weekday, the New York City subway sees more than 5.6 million people pass through it, and in all of 2015, it saw more than 1.7 billion riders. These trains sometimes have people packed elbow-to-elbow, yet your average New Yorker is probably more concerned about stalls from signal problems than about terrorist threats. So why is it that commuters don’t have to walk through metal detectors or take off their shoes each time they hop on a train? And how is it that people can go about their rides with a general sense of ease, in a city that just over a decade ago witnessed the worst terrorist attack the world has ever known? Some of that thanks is owed to two police officers who transformed a scrappy unit, with a beat-up paddy wagon and a handful of dogs, into one of the most advanced K-9 units anywhere in the world. 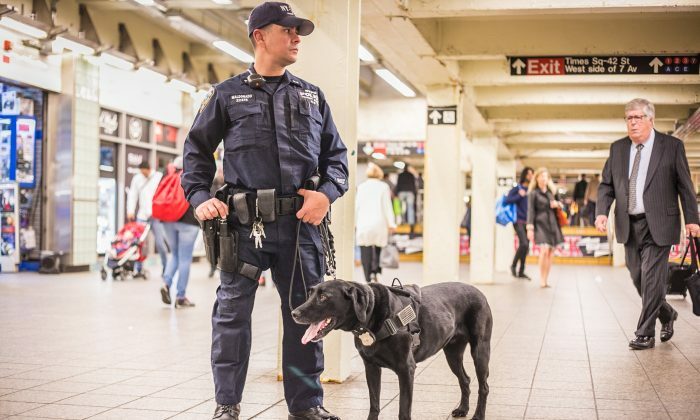 “As far as counterterrorism goes, there is no other agency that I’ve encountered, especially here in the United States, that is as prepared as we are,” said Lt. John Pappas, commanding officer of the NYPD’s Transit Bureau Canine Unit. Pappas and Sgt. Randy Brenner created a K-9 unit for the NYPD that’s able to work in high-traffic subway stations, and that’s specialized in locating suicide bombers or people transporting explosives. On May 17, Pappas and Brenner were joined by several other officers in the Times Square subway station to give a demonstration of the dogs that are the core of this unit: floppy-eared Labradors, with wagging tails and keen noses. These dogs are part of the NYPD’s “vapor wake” program. They’re bomb dogs, trained to detect explosives. But these dogs have additional training that started in New York just 10 years ago, and has drawn interest from police and military units the world over. Your average explosive-detection K-9 gets a four-month training on how to locate bombs hidden in rooms or stuffed in bags. The NYPD’s vapor wake dogs are specially selected from these K-9 units, and given an additional year of training to locate explosives, not in bags or rooms, but carried on people. “What we did is changed the actual unit for New York City, and customized it to be proactive rather than reactive,” Brenner said. Officer Kevin Belavsky stood in one of the busier intersections at the Times Square subway station, while his K-9 partner, Ellis, circled around him on a leash, wagging his tail and happily trotting from person to person as commuters passed by. Most people smiled and kept walking. Some stood to watch Ellis as he circled around, sniffing the air. Others on their cellphones looked briefly caught off guard, but quickly warmed up. Then, Ellis caught something. A man and a woman walked by, Ellis pulled on his leash and briefly trailed the two, and officer Belavsky pulled back on the leash and gave Ellis a yellow ball as his reward. The whole scene was subtle, and unfolded in a flash. The couple who walked by were officers helping with the demonstration, and carried a scent that Ellis had been trained to detect. In 2005, the chief of transit and the police commissioner saw they needed a K-9 unit that could work specifically in transit, and on Jan. 1, 2006, the task to create this unit went to Pappas and Brenner. Training K-9s for this work meant finding dogs that could work in noisy, crowded, and unpredictable environments. This presented a problem. The explosive-detection K-9 units the NYPD had were accustomed to sitting in the backs of police cars, and so they had to handpick dogs that were up to the new challenge, and started bringing them into the subways for on-the-ground training. Brenner said they found even the breed of the dog is important. In the early days, they were using German Shepherds. They found some people saw the dogs as intimidating. “The idea behind it is to keep people safe, and not scare people,” he said. Because of this, they found the Labradors were a better choice. The NYPD now has five K-9 units, with over 100 dogs between them, and they’re planning to grow. When they’re not training, they’re working. And the work they do is in high demand, not just outside the city, but even among officers in the NYPD. Pappas said the last time they held trainings for the K-9 unit, 180 officers signed up, and only 18 made the list once the rigorous vetting process was over. As a testament to the program’s success, the demonstration on May 17 showed the K-9 units working without a hitch—even as a one-man-band, complete with drums and an electric guitar, played and sang in the background; and even as a man approached and ranted to one of the officers about Roswell conspiracies. He said those laughs gradually died down, however. Once they proved the value of their work, they were able to get grants and modern equipment. Today, law enforcement offices from across the country and around the world come to learn new training methods from the unit Pappas runs. Part of Pappas’s job is to ensure that every K-9 in his unit is trained to detect the latest threats and that officers everywhere are benefiting from the research he does. Pappas said the work he and other officers do is about more than just keeping people safe. He sees this work as something that can break ignorance and dispel hatred.